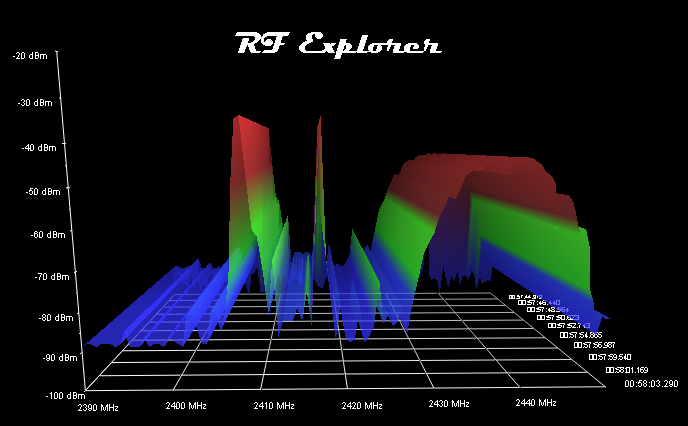 We are happy to welcome a new member to the RF Explorer family. For purchasing RFE6GEN, visit the SeeedStudio website or contact our worldwide distributor channel. RF Venue's new 1-RU platform makes analyzing and monitoring spectrum easier, more practical, and more affordable. We are happy to welcome a new member to the RF Explorer family: RF Explorer RackPRO developed by our Boston based wireless partner RF Venue. RF Explorer RackPRO is a spectrum analysis and monitoring system that lets you see wireless microphone and IEM frequencies inside your venue. How is the RackPRO different from other analyzers? Well, it's housed in an industry standard 19" form factor, for easy integration with existing live and installed cases, racks, and equipment closets. It can be operated either from the onboard LCD screen and touchpad, or from a computer or laptop through a USB cable. And the included Clear Waves software for Windows lets you visualize spectrum in detail, label and monitor transmitter frequencies, and instantly calculate sets of intermodulation free frequencies that can be exported to multiple formats, including those compatible with Shure Wireless Workbench and IAS. Best of all that RF Venue is releasing a Mac OSX spectrum management application this June, so users of Mac computers will finally have access to the RF tools they need. For more details, ordering info and official press release and product description please visit RF Venue website. 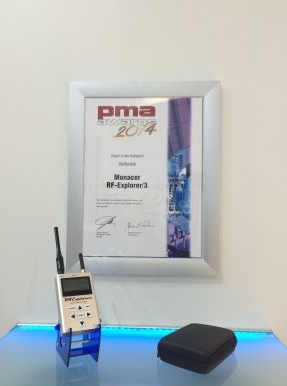 RF Explorer selected as the best "helpful tool of the year" in the PMA Awards 2014 - from Monacor International news. 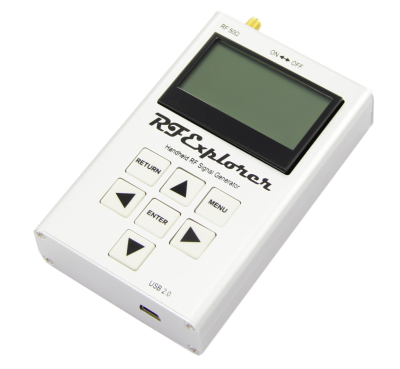 RF Explorer spectrum analyzer can be used as a standalone tool, but can also be connected to a computer for additional features. This page contains a comprehensive list of software available for RF Explorer, coming from different sources and vendors. This list is intended to help you to better understand the different options available, although we are not responsible for any of the 3rd party published applications. We suggest to contact the 3rd party web pages for additional and updated info on any of the offerings. Powerful and fast, includes all standard Spectrum Analyzer features, as well as enhanced functionality such as 3D Waterfall and remote control command. It also includes the required firmware uploader to keep your RF Explorer unit with latest updates. Basic and easy to use standard spectrum analyzer functionality for Mac. Mac OS X 10.7 and later, make sure you install the Silicon Labs driver as per installation instructions. This is the tool you need for advanced RF frequency coordination, a must have for Audio and Video professionals. Precise, wideband RF spectrum scanning, visualization and channel coordination. Includes advanced intermodulation and frequency monitoring features, 5 display charts, and reporting. RF Guru is a complete frequency coordination and intermodulation assistant for Audio professionals. The RF Scanner tool connects RF Guru to RF Explorer and other spectrum analyzers. Complete solution for frequency coordination. It can import CSV files from RF Explorer for Windows for offline analysis. If you are a developer or 3rd party company with software connecting with RF Explorer, let us know, we will add you to this list. 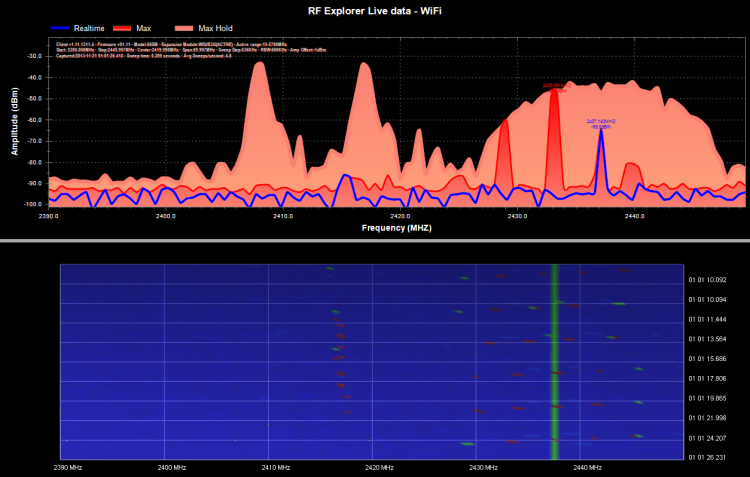 It is the best way to make your software visible to the large RF Explorer user base. RF Explorer for Windows – client tool version 1.11.1311 is available. It comes with some great new features including a high performance 2D/3D Waterfall view. A powerful waterfall screen is very useful feature in detecting spurious signals, dynamic spectrum environments and interference analysis. Some spectrum analyzer brands offer this advanced feature as an option with costs in the range of $1000-2500; some offer a pseudo-3D graphic view and some other spectrum analyzer brands don’t even offer it at any price. RF Explorer is now offering a fully capable 2D and 3D configurable Waterfall for free, thanks to the continuous support of our user community who spread the voice, increase the customer base and makes it a better product everyday. In addition to this powerful 3D feature, the new release include many improvements including filled signal graphs for even easier visualization at any condition, make sure to check the release notes for more details, and the RF Explorer for Windows user manual online. You can get it on the download area. As with all earlier versions, this is free upgrade for all RF Explorer users. If you are interested on some background of the Waterfall development, in earlier releases, the tool included a basic 2D Waterfall contributed by user Josef Jahn – we want to thank Josef very much for making this available to the community indeed! In the meantime, we were exploring different ways to add a more capable, high performance 3D Waterfall and, after testing all commercial options we found no one would really offer the flexibility we need. In addition to that, adding a commercial library of any kind would prevent us from granting the code in open source mode as we currently do – and this has been of phenomenal help to many users and several companies to develop their own customs solutions – there is no other general purpose spectrum analyzer offering the code open source, and we want RF Explorer to keep it that way. So we contacted David Cortes, a seasoned 3D graphics professional consultant to see if he would be interested in this project and he was actually really happy to be onboard. David works currently as a software consultant, has over 20 years of programming experience in UI, graphics (2D/3D) and multimedia programming, using different APIs: GDI and GDI+, Leadtools Raster and medical packages, DirectX, OpenGL, WPF. Working in the field of medical imaging for the last 12+ years with Dolphin Imaging, has been working with DICOM standards and Volumetric 3D scans (ConeBeam technology mostly). Developed a specific morphing of 2D images based on feature lines, taking as starting point cephalometric information, which got him a patent in the U.S. for the technology. Therefore we can now include an open source, free high performance Waterfall display screen that integrates just perfectly with RF Explorer for Windows. Not only that, even more interesting is the fact that it works on top of OpenGL portable standard so we can migrate it to other platforms in the future with moderate effort. We want to thank the beta testers crew (Jose Gavila, Guillaume Desbois, Honza Vrbka, Diego Mayán, Kean Maizels, Giorgio and FredomFighter) who validated the tool in different configurations and environments, provided feedback and helped on resolving several issues.